The 2018 ‘super cycle’ will give way to a calmer electoral schedule in 2019, but turbulence is likely on the oil and gas policy front. The market-friendly reforms that began in Mexico in 2013, and then extended to Argentina in 2016 and Brazil in 2017, could be under threat by end-2019. A short shelf-life for South America’s reforms could quickly flip investor sentiment on the region’s major offshore and unconventional plays. A relapse – even a moderate one – towards resource nationalism in Argentina and Brazil could leave Colombia a pro-market regional outlier – and potentially a big investment winner. However, the more likely mixed outcome at the ballot box in the Southern Cone, and the considerable fiscal restraints on both countries, mean that a complete policy U-turn is improbable. Furthermore, none of the big regional NOCs (from Pemex to YPF) have the financial capacity – or the technical skill – to go it alone. Therefore, competition to attract IOC partners and investors will oblige governments – including in Mexico – to stick with broadly pro-business frameworks. Verisk Maplecroft’s Extractives Risk Index – an aggregate of 37 political, regulatory, economic, security, environmental and human rights indices – shows that the four countries have a broadly comparable risk profile. Criminality is a major issue in both Colombia and Mexico, while the risk of terrorism in Colombia drags its score down further. Security will not improve significantly in either. Therefore, a worsening of the operating environment would remove the offsetting role played by strong pro-business frameworks, solid economic performance, and stable political landscapes. Without a structural shift in security policy, the presence of drug trafficking organisations (DTOs) in Mexico will continue to grow under Andrés Manuel López Obrador (AMLO). And with DTO expansion, pipeline taps, kidnap and extortion rates will also rise, pushing up security costs. Extortion is common in areas with high rates of oil theft, and Pemex reported 10,363 incidents of pipeline tapping last year alone. Companies entering JVs with Pemex need to determine how the rise in tapping will decrease the NOC’s profits and investment capability. In downstream, companies are exposed to supply chain contamination as organised criminal groups legalise stolen fuel by channelling it through legal retail networks. In Colombia, President Iván Duque will have to tread a fine line between his pledged tougher security policy and the risk of collapsing the peace deal with the FARC. Verisk Maplecroft expects the exploratory peace talks with the country’s other guerrilla group, the ELN, to end without a positive outcome. 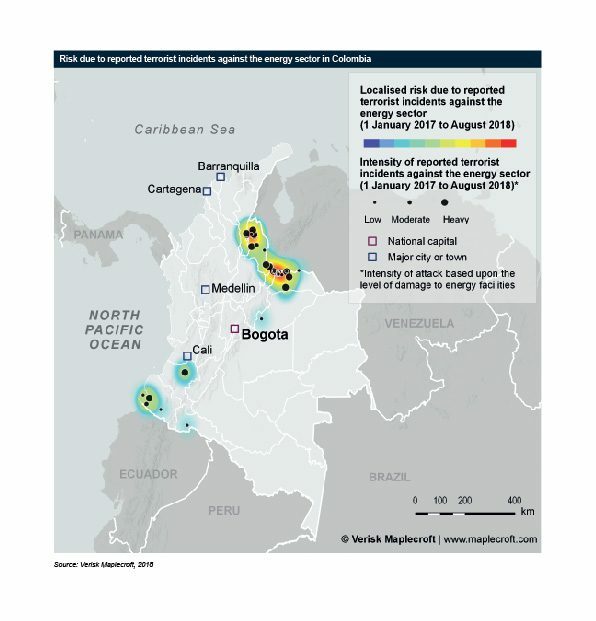 This means that attacks against oil infrastructure, one of the ELN’s main tactics, are set to continue. If implementation of the peace deal with the FARC falters under Duque, the agreement could collapse. Recidivism by former FARC members could boost the ranks of the ELN, as a willing host for ex-guerrillas. As such, direct and incidental security risks could increase, including the likelihood of more aggressive turf wars between criminal groups for control of the cocaine business. In Brazil and Argentina, a stronger performance in the Threats pillar does little to assuage investor concerns over economic and political volatility. The key variable is whether the incoming administrations in Brazil and Argentina are able to put the economy on a more sustainable growth path while maintaining the pro-investment reforms of recent years. In both cases, investors are looking at a potentially boggling array of changes to economic and regulatory frameworks. While these will be positive during 2019, there is a high chance that this could worsen from 2020 onwards. In Brazil, popular frustration with the political class will usher in a government that campaigned for structural reforms, but that lacks executive experience and has yet to demonstrate the political will to stay the course if congressional negotiations hit the president’s approval. In Argentina, political and policy stability depend on the government’s capacity to turn the economy around in H1 2019. A protracted recession and sustained high levels of unemployment could weaken the pro-market options at the ballot box and push up support for a variety of more interventionist options. An upsurge in policy uncertainty in Mexico is the only certainty for the O&G sector in 2019. AMLO’s energy policy foreshadows greater politicisation of the 2013 energy reform and threatens fiscal instability, both at federal government level and for Pemex. Senior energy appointments to date have been political and ideological in tone. There appears to be less of a focus on improving Pemex’s performance and competitiveness (as was the case under Peña Nieto). Within the current 2013 legal framework – and without recourse to the constitution— this politicisation of institutions and regulatory agencies could put a brake on implementation of the reform. For example, the executive ultimately decides which E&P blocks to put out to tender. It can also impose new limits on private sector downstream involvement; amend local content requirements; delay permitting processes; and dictate Pemex’s policy on private partnerships and JVs. While the ‘Pink tide’ of the early/mid-2000s was able to deliver electoral dividends, it failed to bring economic ones. In the post-commodity supercycle context, governments need to boost production to contain fiscal pressures. Ultimately, the need for fiscal consolidation may prove a stronger check on resource nationalism in the region than political ideology. Mexico, Colombia and Argentina are all at various stages of trying to reverse production declines. In Brazil, the fallout from the Lava Jato scandal and a ballooning fiscal deficit will limit the ability of any future president to unwind the recent reforms. The electorate wants more transparency, better public service delivery and cheaper fuel – greater state intervention in Petrobras would accomplish the opposite on every item. In Mexico, AMLO’s vision is too expensive to deliver without IOC involvement and the government will be forced to maintain a moderate degree of pragmatism. Economists put the minimum cost of his ambitious energy plan at MXN284 billion (USD15.2 billion) in the first three years, increasing Pemex’s 2018 E&P budget by 44%. To cover this, Pemex would need to turn to capital markets, swelling its already substantial debt. Neither the federal government nor Pemex can meet this investment target without major additional borrowing. To deliver, AMLO ultimately may have no option but to remain open to further private investment in the energy sector – both upstream and downstream – even as he looks to retain certain privileges (but also obligations) for Pemex. Verisk Maplecroft’s interconnected approach to risk provides oil and gas companies with unparalleled insight into country, sector, corporate and supplier-level exposure to the full spectrum of political, economic, human rights and environmental issues. This enables our clients to build an in-depth understanding of how their technical and commercial imperatives interact with above-ground-risks in terms of impact, exposure and consequence. Our tailored solutions enhance strategic planning and help you make better, more informed decisions based on the world’s most advanced global risk data and expert, independent insight into the key issues affecting your people, operations and business. Jimena leads Verisk Maplecroft’s Americas research team, with regional and thematic experts based in the UK and Mexico. 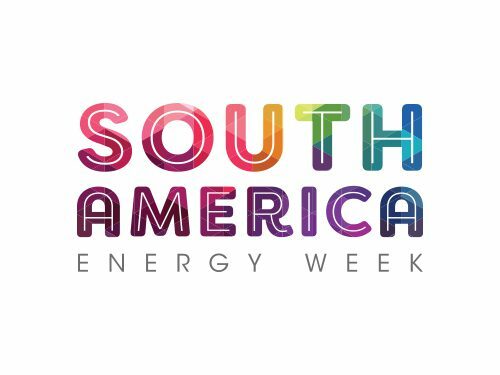 She is the Americas expert on Brazil and the Southern Cone, and frequently provides advice to multinational energy companies, multilateral institutions and buy-side investors on above ground risk in Latin America. She participates in diplomatic, academic and business forums, addressing issues of regional and country-specific concern. Jimena also makes regular contributions to the British and foreign media. 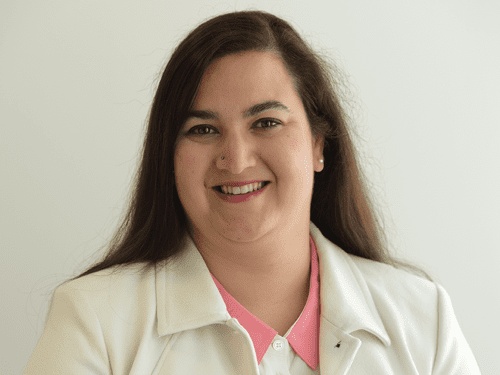 Jimena studied History and Political Science at Randolph-Macon Woman’s College and obtained a master’s degree in Latin American Studies from the Institute for the Study of the Americas, University of London. Jimena is a native Spanish speaker and is also fluent in English and Portuguese.